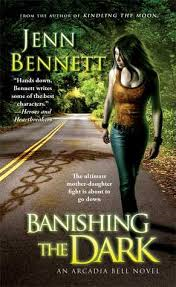 My second pick for my top 10 books of 2014 is Banishing the Dark by Jenn Bennett. In Book Four of the beloved urban fantasy series Romantic Times calls one “for your keeper shelf,” the ultimate mother-daughter fight is about to go down. Complicated does not begin to describe Arcadia Bell’s life right now: unnatural magical power, another brush with death, and a murderous mother who’s not only overbearing but determined to take permanent possession of Cady’s body. Forced to delve deep into the mystery surrounding her own birth, she must uncover which evil spell her parents cast during her conception…and how to reverse it. Fast. As Cady and her lover Lon embark on a dangerous journey through her magical past, Lon’s teenage son Jupe sneaks off for his own investigation. Each family secret they uncover is darker than the last, and Cady, who has worn many identities–Moonchild, mage, fugitive–is about to add one more to the list. Banishing the Dark is the fourth, and final, book in Bennett’s Arcadia Bell series. I, for one, am very sorry to see it go. Bennett’s world is incredibly fun and well-realized, populated with Earthbound demons with specific “knacks”—supernatural abilities—and human magic-users. Cady, the protagonist, is one such human magic user who comes to find out that the magic Moonchild ritual surrounding her conception have given her more power than she realizes, and that her beloved parents were not the people she thought they were. But what has always drawn me to this series most is the characters, especially the supporting cast. Cady’s boyfriend, Lon, an Earthbound demon, is strong and reserved, a dominant personality who is capable of allowing Cady to take the lead when necessary. He’s significantly older than Cady (42 to her 25), which is realistically treated as an obstacle to their burgeoning relationship. By book 4, their relationship has become more established, but Bennett continues to find ways to keep their dynamic feeling fresh and compelling. Lon’s son, Jupiter, is intelligent, exuberant, and talkative. He’s the complete opposite of most of the moody teens you see in fiction—and, quite frankly, in real life—and he’s a joy to read about. Banishing the Dark marks the first time he’s had point-of-view scenes in the series, and they’re great fun. Unlike many fantasy series, where the main attraction are the supernatural aspects of the story, it’s the human factor that keeps me coming back to this series. Bennett also has a way of writing suspenseful scenes that keep you glued to your seat. I read the book in one sitting, unable to put it down. Book 3 ends on a cliffhanger, and I spent a year anxiously awaiting this book. Once I got it, I wasn’t disappointed. The arc of the series does build from book to book, so I’d recommend starting with book 1, Kindling the Moon.